In the age of YouTube, songs are meant to be seen, but producing a music video takes different skills and a different approach altogether. You may know a talented artist who needs a music video, and you might already have a pretty great idea for the video. Now you want to back that creativity up with a smart production plan. In this post, we’ll break down the process of how to shoot a music video. As you listen to the song you’re going to cover, your mind starts to fantasize. You’re gonna use slow-mo there, a close up of a syringe there, a wide shot of a goth drummer there--it’s going to be a weird country music video. While you’re brainstorming music video ideas, you have to remember to write them down into a music video script. Unlike a traditional screenplay, your music video script should list your visuals on one half of the page, with audio, FX, and lyrics on the other. StudioBinder has a free screenwriting software that allows you to switch the layout to AV scripts - so when you're ready to write your music video I highly recommend you use our free and unlimited script writing software. Detailed is always better to make sure your vision is properly communicated. Of course, you can’t have a music video script without some great music videos ideas. Here are 89 ideas to jumpstart your creative juices. If you haven’t already, you need to fill out your music video script before entering the next step. Just like any other type of script, a production staffer (if not you) will have to breakdown your script. Breaking down a script simply means listing out all the elements you’ll need for your shoot. Are you going to feature a CGI dragon? Sick. But that means you’ll need a VFX crew. When you break down your script, you’d note something like that. Does your lead singer shred on a guitar? That guitar would be categorized as a prop that needs to be brought to set. While you can breakdown your script with this free script breakdown template. You can also use film production software like StudioBinder where you can invite team members to collaborate. While you flex your creative muscles, production software can auto-generate your breakdown reports which can then be exported into a shooting schedule. Your completed script breakdown will serve as the basis of your budget. Knowing all the elements you need determines who you’ll need to hire to bring your music video ideas to life. If you’re featuring a series of death-defying stunts your budget will be considerably higher than a live performance capture. With your musical artists taking care of the audio, your job as Director primarily extends to the visual. While a well-written script can easily be turned into a shot list. Watch how Brent from ShareGrid shot listed his music video. Music videos don't require you to write a the script like a film or TV show, but rather what we call an AV script (Audio/Video). AV scripts are like any document with a two column table structure that, more often than not, have the audio in the left column, and corresponding video in the right hand column - which allows you to sync you music and visuals. StudioBinder has a free screenwriting software that allows you to create AV scripts. You can write an unlimited amount of pages and scripts that will sync with each and everyone of the additional StudioBinder features. With musical artists’ schedules constantly in flux, most music videos are shot over the course of two jam-packed days. Because of this constraint, it’s not a bad idea to choose one location for your music video. Shooting at one location will make it easier to coordinate your talent and crew (more on that later) to the set. Shooting in one location saves your designers time because they only have to light and dress your location for one day of shooting. Scope out locations that suit your music video script and get a running list going. Also make sure to download this shooting location release form. Don’t be daunted when reaching out to unlikely locations, you’d be surprised how often people will say yes for free publicity. Pro Tip: HOW MUCH DOES IT COST TO MAKE A MUSIC VIDEO? If you’re an indie filmmaker, it can cost anywhere from 5,000 to 500,000 dollars. If you’re making a video for your own band, chances are you can save money by having your friends hold the camera and flick on the fog machine. With low budgets comes room for innovation as well as an increased risk of bumps in your production process. 5. How to hire your film crew? A music video script is nothing without a film crew, ready to hit the ground running. If you’re operating on a low budget, hit up your friends to round out your production. If you have a budget, check out ProductionBeast to gather your crew together. You can also post an ad on Facebook. By posting a blurb in these groups, you can land yourself a film crew in your area. Make sure you have plenty of pizzas on the craft services table. The key roles you’ll need, regardless of your production scale are: your camera person, lighting pro, and director. Outside specialists should be brought on based on your music video script breakdown. If you’re working on a slightly smaller budget than these guys, you’ll want to make sure your crew brings their own equipment to set. If you’re procuring the equipment yourself, check out BorrowLenses or ShareGrid where you can easily rent camera and film equipment. Don’t forget to rent extra batteries, memory sticks, and film (if you’re going down that road). In order to protect yourself against liabilities, be sure to purchase short term production insurance for your music video shoot. We’ve defined the legal mumbo jumbo in our previous post, but getting a short term insurance policy fully covers your limited shoot. It’s unlikely you’ll need an annual policy unless you’re a production company. Learn how to make a music video contract. Once you’ve assembled your team of talent and crew, it’s time to figure out when you’re actually going to shoot the damn thing. From your music video script, you’ll have a clear idea how extensive and complicated your shooting schedule will be. If your shoot is only one day, but encompasses many locations, be sure to account for company moves. Before you can make your call sheet (more on that in a second), create a shooting schedule that plots out the order of scenes you'll be shooting. That way everyone on set understands the schedule, and you'll know how to best schedule each cast and crew member's call time. For a one day productions, this step is a breeze. It’s hard to keep track of everything on day one of shooting a music video. Crew has to get there before the musicians show up, sound engineers have to set all the equipment with the talent, the list goes on. In order to organize the madness, producers send out call sheets to alert everyone when to come to set, and where they're supposed to park, etc. StudioBinder can generate call sheets directly from your shooting schedule. Call sheets are mobile-formatted and personalized to avoid any confusion. It'll even send out SMS reminders - perfect for crew and artists on-the-road. Bottomline: a well-made call sheet ensures that production will start on time. Any working professional will say that a good call sheet is a key giveaway of the professionalism a shoot. You can’t shoot a music video without music. Make sure you not only have a copy of the song on set, but also loud speakers so the artists can lip sync. Download your FREE ​music video script template​. Learning how to make music videos takes time. By the time you wrap on your first music video and send it off to YouTube, you’ll have learned a million lessons you didn’t know before. Making a music video takes a team of dedicated people who will each challenge hopefully less than frustrate. But as a director or DP, one of the most important aspects of shooting a music video is creating a music video storyboard and/or shot list. 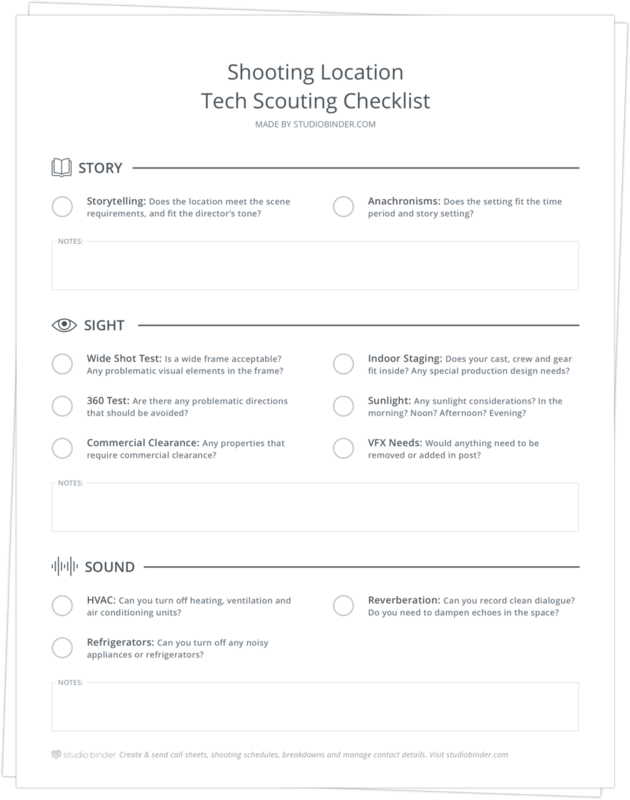 A shot list ensures you have a clear vision and logistic game plan for each shoot day. A good shot list can help you estimate the prep and shoot times for each setup so you don't fall behind schedule. Up next, read our video post on how Brent from ShareGrid shot listed his music video "Selfish" by Theevs. Last but not least, post your music videos in the comments, or just the songs, if you’re starting production! Easily create script breakdown sheets online. Import scripts. Tag elements like props, wardrobe, and cast. Create breakdown summaries and DOOD reports in a snap. That rooftop view is insane.. Looking for a new position with good salary seems being a hard task nowadays. your services and products, that will drive more traffic and lead to higher revenues for your company. Thanks for the heads up! We will look into it. Also glad you enjoy the blog. Feel free to comment with suggestions for future posts. We love to get reader feedback! This is really helpful, now I have at least an idea when shooting the video for cadance. This article is amazingly explained! Thanks for sharing what you know, I’ve learned tremendous knowledge about making a Music Video from this article! All the tips you have given are really helpful. I have got many useful tips from this blog of yours. Thanks for sharing the pieces of information.